First of all, I’ll explain the name. The first ship of first ship of non-indigenous settlers to arrive in Seattle arrived on Alki back in the 1850s. The name of that schooner? The “Exact”. Not a bad name, actually. 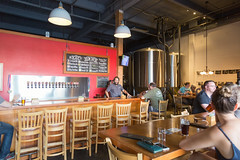 The brewery has been around for about a decade, having expanded and opened the current location in 2012. Inside, it’s your basic brew pub setup: a bunch of fermenters, a bar for tasting and drinking beer, and a reasonably sized dining room. 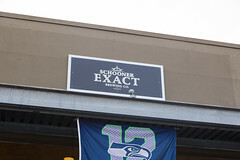 The focus at Schooner Exact is definitely more on the beer than the food (and in general, that’s a good thing; I’ve been to entirely too many nominally good brewpubs where they tried to do both really elaborate food and good beers, and usually one suffers. The place doing both often, but not always, suffers), with more than a dozen different beers available at our visit, including several Belgian sours and a good selection of IPAs. Indeed, each of the beers I had there was well enjoyed, and, quite frankly, the perfect refreshment after a long day of hiking through a good chunk of Seattle. But while the food isn’t the focus of Schooner Exact, I’ll have to say, they do a decent job at trying to have a pleasant, well-rounded menu. Most of it is pub fare, with a selection of burgers, sandwiches, and salads, with a few rather interesting appetizers such as a steak tataki or an ahi salad, and they seem to be doing a good job of things. Seeing that I had had food at a good half dozen places already that day, I opted for a smaller dinner, getting their orecchiette. 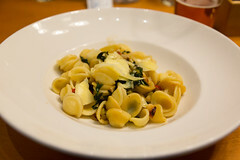 It wasn’t much to photograph, but it was a rather nice pasta, al dente, served up in a light cream sauce with some pancetta and wilted greens. I’d happily get that again, and everyone else was also pleased with their dinners. For a group of tired, sweaty, and slightly grouchy hikers coming in unexpected and looking for a group table for 16 people, I’ll have to say, Schooner Exact was quite welcoming. We got a nice table just off the bar, and our friendly server efficiently served up pitchers of water and made beer recommendations for everyone. While it’s not a neighborhood of Seattle I expect to revisit anytime soon, it was quite a pleasant beer destination, and one I wouldn’t mind visiting again (perhaps on the way too or from Seatac). You know, I’ve found Western Massachusetts really has a lot to offer, especially on the food and drink scene. The “Pioneer Valley” between roughly Greenfield on the North and Springfield in the south is a wonderful combination of small college towns, rural villages, and post-industrial mills towns (much like my own Upper Valley of VT/NH). Amongst these towns, a plethora of small breweries, bars, restaurants, and food provisioners have popped up, and there are even a few nice ethnic regions like Chicopee (Polish) and Springfield (German). So I always love heading down there. So, when a recent event had us heading down to Chicopee, it was also a chance to explore more of the town. Sure, being a weekend day, several of my Chicopee favorites like Millie’s Pierogi (handmade pierogi sold out of a building behind a car dealer) and Chicopee Provisions (horseradish kielbasa) were closed, but being around at breakfast time gave me a good chance to check out a place that’s been on my hit list a while: The Copperline.